The concept of a Gemba walk comes from TPS, the Toyota Production System. Simplistically, the Japanese word Gemba refers to the site or the workplace. 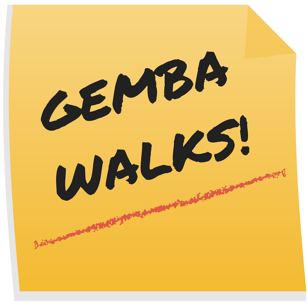 A Gemba walk involves a leader going to the workplace for accurate information rather than sitting in an office or conference room making changes without knowing what is happening in the real world. A Gemba walk is very focused. The intent is for the manager or leader to gather a small cross-functional team to “go see” a specific area of a process and “ask why,” related to the details of a process. This yields plenty of fodder for root cause analysis and continuous improvement cycles that will help drive out the eight wastes and increase value for the customer. For best results, create a value stream map with validation from early workplace visits. Use this map to identify where in the flow to focus each Gemba walk. Select one process and follow it from start to end. This focus is key for keeping a manageable scope for each regular Gemba walk. It also helps avoid dysfunctional activity from the silo thinking that happens if only partial process elements are studied, leading to optimizing some elements but sub-optimizing the flow. 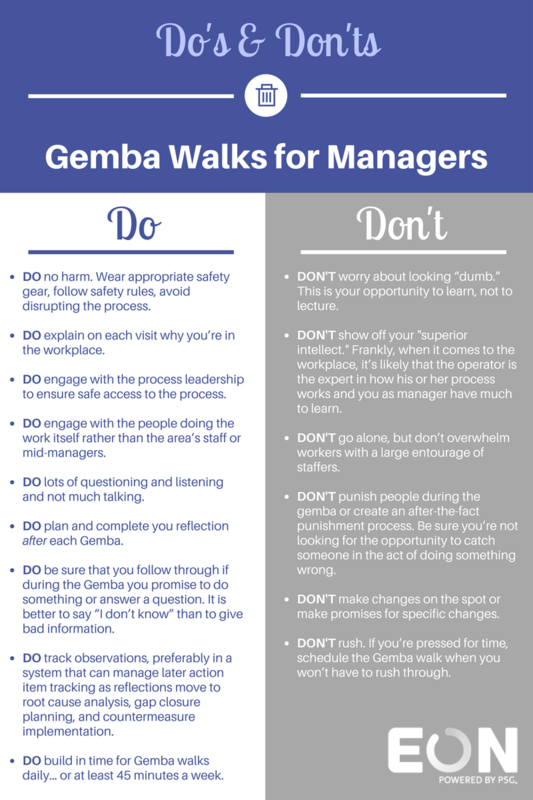 If Gemba walks are perceived as a manager doing a walk through simply to determine where to reduce headcount, engagement efforts will fail. The Gemba walk can only be successful when it is built on a foundation of trust and mutual respect. To be self-sustaining, the Gemba experience must be positive rather than punitive for both the leaders and the employees. 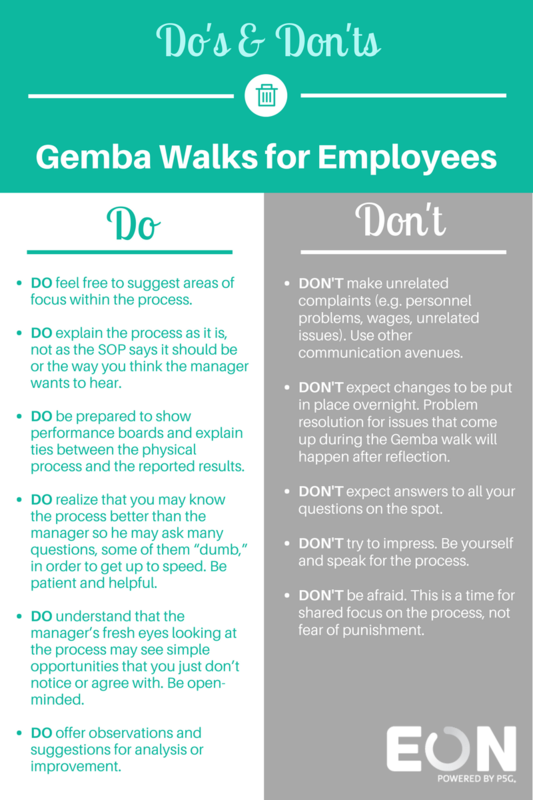 Provide communication and training upfront so both employees and managers know what to expect when Gemba walks happen. 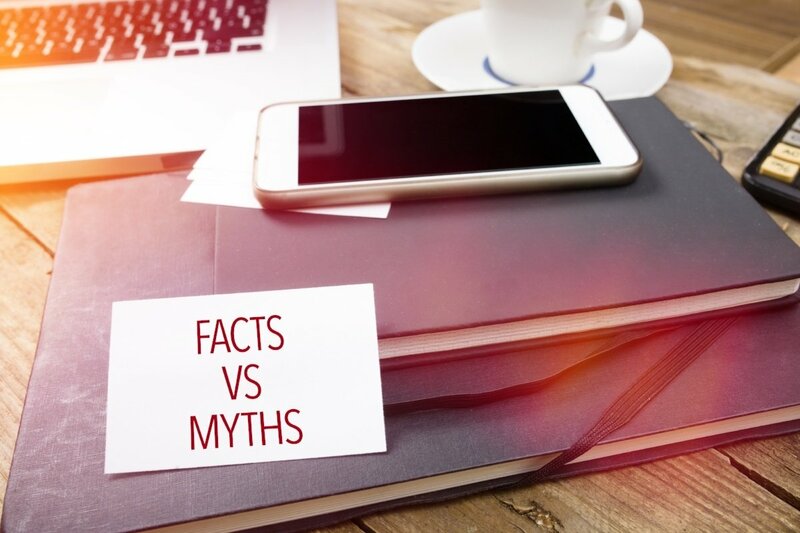 Employees may feel uncomfortable during Gemba walks because they are in the somewhat unusual role of spending extended time with the boss, feeling that they need to defend their work or maybe even tell the boss he’s wrong about something. An emphasis on the intent of a Gemba walk as a focus on the process rather than on people helps avoid discomfort. Training should include a few specifics on dos and don’ts for the employee’s role in the Gemba activity. The manager may also feel awkward, out of her comfort zone, away from her normal strategic responsibilities and dropped into the nitty-gritty details of a process where she is not an expert. 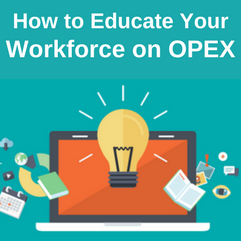 It’s important for the manager to step out of the leadership role and look to the process operator as the expert. These dos and don’ts can be good reminders. 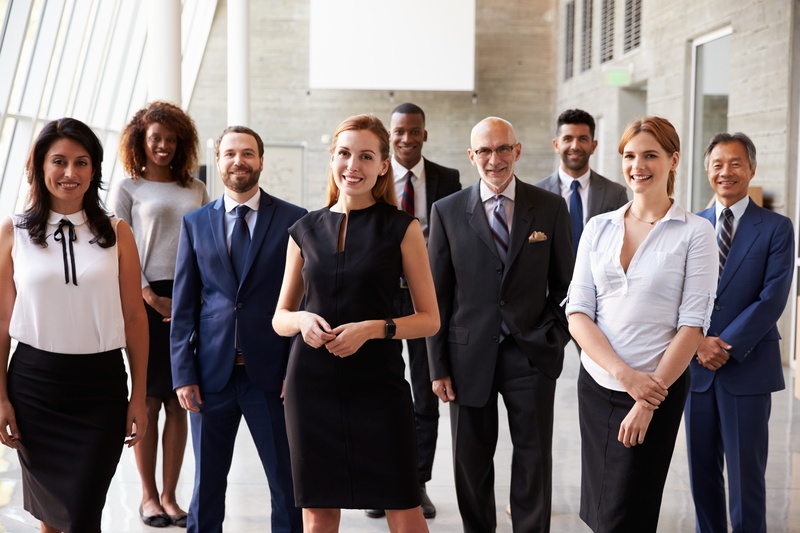 MBWA or Management By Wandering (or Walking) Around might look similar to Gemba because managers are out in the workplace instead of in their offices. They’re interacting with employees and hopefully building positive relationships and learning something they didn’t already know. But if wandering is all that happens, the benefits are limited. Remember that continuous improvement is most effective when it follows a systems thinking structure such as Lean. Individual process steps are part of an overall value stream. Using the value stream map to identify areas to prioritize gap analysis and execute gap closure efforts will provide the biggest gains within the framework of the whole flow. Gemba walks have that focus. “Wandering around,” even when it results in localized improvements, is not likely to provide sustainable gains leading to an optimized system.